For some years, Nathan Moroney has been running a multilingual color naming experiment. In the experiment, participants are shown seven color patches picked at random from the sRGB cube. Next to each patch there is a field for entering a name for the color. The random distribution is uniform, so one would expect to obtain a uniform distribution of color names. However, this is not so. There are eleven basic color terms that come to mind very fast, so one can expect to hear them more often. 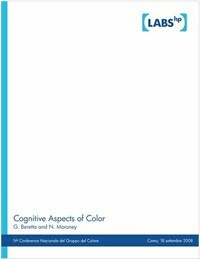 Naming colors is an acquired skill, so it will depend on the participant's socioeconomic status (SES). Participants in the color naming experiment tend to be from a high SES, so one would still expect a to get a fair amount of non-basic color terms. 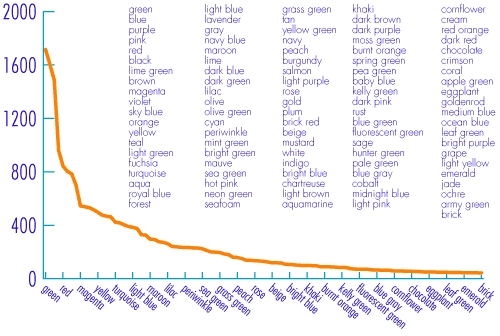 We are plotting the 101 most frequent color names collected so far in the experiment. For navigation, the abscissa marks each fifth color name from the ordered list above. For a number of reasons, in such a crowd-sourcing experiment there is low precision and there is a certain amount of bogus data. This is handled by weighting and averaging the contributions. The distribution's long tail entails that a large amount of data needs to be collected to obtain a reasonably rich color name dictionary. A rich dictionary is important, because for us color scientists it is not the dictionary itself that is of most interest (linguists deal with that). What we are interested in, is to invert the data and build a tool that given a color name shows a color patch of that name. 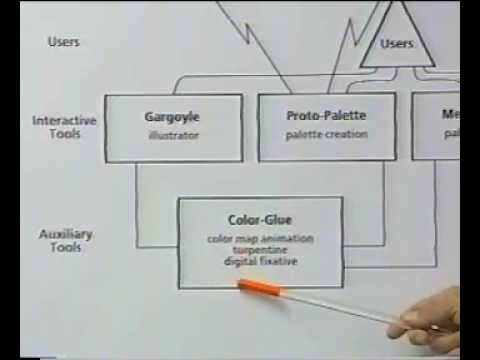 This allows us to help you improve your color naming skills. English being the internet's lingua franca, we have sufficient data in English. However, in the other languages we have insufficient data to be able to average the non-basic color terms. At this time we call for readers speaking Italian. 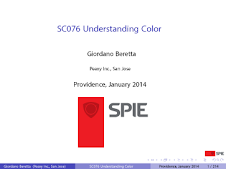 If you do, please help us by naming colors in Italian at this link. 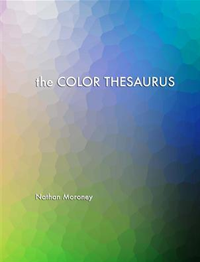 Your contribution will make the color thesaurus more useful.